Do you have old fillings in your mouth that have been there since childhood? In some cases, many years of wear and tear along with eating staining foods could leave these fillings looking discolored and unattractive. This could make you feel self-conscious when you talk or laugh, and unfortunately, older fillings may also become ineffective at protecting your teeth. So what can you do? First, visiting your dentist every six months is important for ensuring that your fillings are still in good shape. If one of these fillings became defective, your dentist would be the first to notice it and could recommend a replacement. Today, there are a variety of other options out there that may not have existed when you first had that filling, so deciding on a restoration might be a bigger decision. 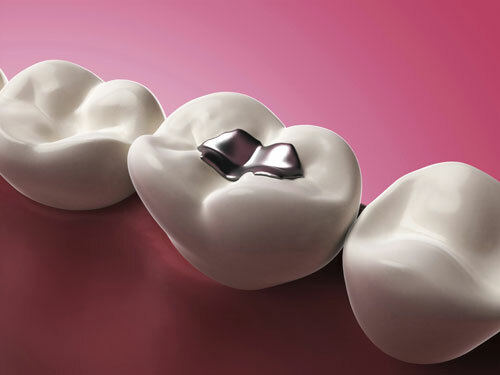 • Composite or ceramic fillings. If your dentist thinks that you should replace an old filling with a newer option, a ceramic or composite filling might be your best option. These fillings are tooth-colored options and can be more discreet and less noticeable than your former silver option. • Inlays and onlays. These are customized fillings that can be made out of porcelain and composite in a dental lab. They are best suited in the back teeth to be placed on the chewing surfaces, and they can be a great benefit to teeth that have been plagued by unattractive or defective fillings. • Crowns. If a crown is so damaged that a filling won't do the trick, you may need to crown. This restoration serves as a cap to cover and protect your entire tooth. Even if you aren't experiencing any problems, if you are simply ready to get rid of your old, gray fillings, contact our office today.